Hoping to be King of all the kingdoms? Well, wearing this evil king fancy dress costume you'll be halfway there. Your subjects and rivals will be quaking in their boots as you plot your dastardly plans. 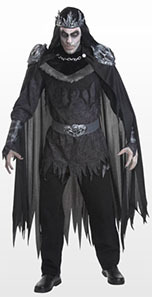 This scary costume is ideal for Halloween or for a TV / movie theme party and includes a black tunic, a cowl trimmed with faux fur and a black cape with jagged edging. Also included is a black belt with a silver sculpted buckle and a pair of black cuffs.